The directed practices allow to rehearse the learned, under the supervision of the professors. In Milongas, or social dance we freely practice our dance. The seminars or workshops allow you to see other ways to conceive the tango dance and enrich what you have learned in the regular classes. 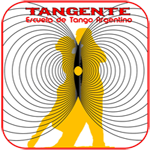 The Festival, with an international character, has the vocation to allow the students of tangent the encounter with tango players of other horizons and to allow them to see dance live to renowned teachers, enjoying also their teachings. The tangent faculty is in constant training and review of their teaching program to meet the needs and expectation of the students. From the first class we establish the bases for our students to integrate the movements of the dance and the mechanics of the Tango. The classes are developed in good humour but with professional and advanced didactics and pedagogy. We offer the possibility of private lessons. They can be where students choose, either at home/local or in our premises. We do not accept more than 2 couples in each class. For the bride and groom and/or the godparents and/or the guests, we prepare you to dance a Tango (or a Creole waltz) at your wedding. Specific packs are available for wedding preparation that is always held in private classes. We have the possibility to animate sessions with DJ or even with live music. Contact us to ask for a quote.